Are you (or your child) preparing to head to college this fall? Having your own printer – especially one that you know you can count on – will make your college experience easier and more convenient. College usually means writing and printing a lot of papers. Be careful! If your printer isn’t up to these demands, you could be adding a lot of unnecessary stress to your life. Some printers are expensive and work extremely well while other pricey printers aren’t worth the money. A good printer is vital for the college student since it’s a tool that will make life easier and one that will get a lot of use. After extensive research and testing, We selected the top 10 printers that are ideal for college students in 2019. One of the biggest frustrations of owning a printer is running out of ink and having to figure out how to change the ink cartridges. This Epson printer features cartridge-free printing and includes up to 2 years of ink. With the ability to print 4000 pages with black ink and 6500 pages with color ink, that’s the equivalent of 20 sets of black/color ink cartridges. This unique Epson ink system alone offers a ton of value. When it is eventually time to refill the ink, you just buy these surprisingly low-cost replacement bottles and easily fill up the tank. The ink isn’t the only thing about this printer that is ultra-convenient. It has built-in wireless plus Wi-Fi Direct, allowing you to easily print your studies from your computer, iPad, iPhone, and Android tablets or smartphones. You can print wirelessly without a state university wifi network as well. This 3-in-1 printer-scanner-copier is relatively compact so it won’t take up all that much space, even in a cramped dorm room. Verdict: The Epson Expression ECOTank isn’t the printer to use to print your wedding invitations, but it is pretty much the perfect printer for the typical printing needs of a college student thanks especially to its low-cost ink system. 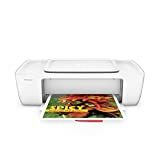 This printer also offers fast printing speeds, support for a wide range of paper sizes, and the ability to print high-quality borderless photos. With a subscription, your printer will automatically order ink that will be shipped to you for as little as $2.99 per month. This will prevent the college student’s worst nightmare of running out of ink the night before a big paper is due. Are you an Alexa user? Alexa can add a lot of convenience to your academic life, especially when it works with other devices. This printer is Alexa-friendly, a prime choice for allowing you to print wirelessly from a voice prompt. Even if you’re not an Alexa user, this printer offers a number of super convenient features. One of them is the optional HP Instant Ink. The HP Envy 5055 is also Dual-Band Wi-Fi and Bluetooth Smart, allowing you to easily print wirelessly from a number of devices. With the HP Smart app, you can even print straight from a social media account or a cloud service like Dropbox, iCloud, or Google Drive. For the low price, it’s surprising how good the quality is, especially for printing photos. The printer is Energy Star certified and has a 1-year limited warranty with 24/7 free web support. Verdict: The low-cost HP Envy 5055 offers fast and easy wireless printing, along with a potentially expensive but ultra-convenient subscription service ink system. Most college students will plant the printer in their state university’s dorm room and keep it there but some might need a more portable option. This Canon printer is shockingly small and lightweight but it still manages to print quite well. It’s easy enough to throw this in a laptop bag or backpack and take it from home to school to work or anywhere else. There is even an optional battery to make taking the printer on the road even more convenient. For Apple users, this printer also offers the convenience of AirPrintM. This lets you wirelessly print from iOS devices. You can also print wirelessly from some cloud services using the Canon PRINT app. You do have the option of buying a bundle with extra ink and/or a battery which ultimately adds to the value. This printer will help churn out papers but it’s also great for printing beautiful photos. Borderless printing and a simple photo printing system make this particularly easy. Verdict: The Canon Pixma IP110 stands out for being highly portable and taking up less desk space in a cramped dorm room while also printing in surprisingly high quality but setup can be a pain and the printing speed is slow. Today’s college student will probably make regular use of cloud services. The cloud can definitely be an easy way for students to keep all of their academy related work organized and easy to access from anywhere on any device. A printer that works with these cloud services can be a big help. This Canon printer offers easy integration with a number of cloud services, including Google Cloud. For Apple users, you can use AirPrint to print from your iOS devices. Android users also have easy printing options. All in all, this printer goes out of its way to make it easier and more convenient to print what you need from just about anywhere. You can even print photos directly from Instagram or Facebook. You can also print in the more traditional ways, through either a wired or wireless connection to a laptop or desktop computer. In addition to giving you lots of options for how to print, the MG6820 offers scanning and copying functions. You have the option of 2-sided printing but the scanning is only 1-sided. Verdict: The Canon MG6820 is a reasonably priced 3-in-1 machine that prints well and makes it easy to print from a huge range of sources. Working on big projects at the last minute is something most college student’s go through at least once. All too often, this is when some kind of technological disaster strikes. A printer running out of ink at the worst possible time is a nightmare but it’s one that can be avoided. This printer from Brother is Amazon Dash enabled. This means that when the printer is running low on ink, an automatic replenishment system is activated and new ink will be shipped to you before you run out. The high-yield replacement toner cartridge means also makes this a cost-effective solution. This laser printer is a serious machine. It’s fast with a print speed of up to 42ppm. It can hold a lot of paper, 300 sheets expandable to 1,340 sheets with optional add-on trays. There is automatic 2-sided printing technology. It’s easy to print using either the Ethernet port or a wireless connection. It is also compatible with most mobile devices and cloud services. The overall print quality isn’t quite as high but this black-ink-only printer isn’t designed for crisp visuals. It’s a printer for business and for schoolwork rather than for printing photos and for this purpose, it works extremely well. Verdict: The serious student looking for a convenient and easy-to-use printer that can handle huge printing loads will be well served by the Brother HL-L5200DW. 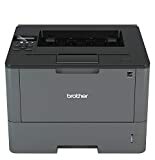 For a pretty reasonable price, this Brother printer is an all-in-1 desktop machine capable of scanning, copying, and faxing as well. As a fax machine, it uniquely lets you fax in color as well as black and white. As a scanner, you can also select either color or B/W scanning and you can scan directly to Google Drive, Dropbox, Facebook, Box, Onenote, and more. As a printer, there is an automatic document feeder system and you do have the ability to automatically print on both sides of the paper. This is yet another printer that is Amazon Dash enabled, providing convenience and eliminating the worry that you will run out of ink right when your education demands it. Printing right from your tablet or smartphone is easy, using your choice of AirPrint, Google Cloud Print, Brother iPrint&Scan, or NFC “touch to connect.” Another peace of mind factor with this printer is the 2-year limited warranty and free lifetime phone support. Verdict: Most college students today don’t do much faxing but it’s nice that the all-in-one Brother WorkSmart MFC-J880DW gives you the option while also being easy to use, working with a variety of cloud services, and offering the convenience of Amazon Dash ink replenishment. If your major is going to require a lot of writing or if you’re going to have to print a high-page-number thesis, you’ll want a printer that can easily handle this volume. You’ll also want a printer that isn’t going to take forever to crank out all of those pages. This Lexmark printer has you covered. It will print up to 40 pages per minute and can easily print 7,200 pages per month. When printing pages with complex graphics, the print speed slows down to 6.5 seconds but for image printing that is pretty fast. The high volume capacity might make this printer a good choice for roommates or a group of college friends to go in on together. This monochrome printer is not a good choice for anyone hoping to print out photos as well as those term papers, as it will only print with black ink. It can handle 2-sided printing, allowing you to save a bit on paper. You can print by connecting via Ethernet cable or you can use WiFi. Unfortunately, to print wirelessly, you will need to buy a separate wireless network card. Printing right from mobile devices is an option as well. Verdict: The Lexmark 35SC060 is the best printer for college students who expect to do a ton of printing, making it a good choice for roommates or a small group to go in on together. This is an even more reasonably priced alternative to the Lexmark 35SC060. While it won’t handle history department sized volumes quite as well as the Lexmark, this Samsung machine is another fast monochrome printer with a great text print quality. The 400 MHz processor and 64 MB memory make printing quite fast, with the ability to print up to 21 pages per minute. Samsung’s unique ReCP (Rendering Engine for Clean Page) Technology ensures that text is crisp and clear, something your teachers and professors will definitely appreciate. Wireless printing is easy, using NFC technology and/or the Samsung Mobile Print App. It’s easy to print from just about any device or from any of the most popular cloud services like Google Cloud. For the environmentally conscious or those just looking to save as much money as possible, there is an Eco button that allows you to reduce toner, paper, and energy use. This printer is also Amazon Dash enabled so you don’t have to worry about running out of ink. Verdict: For a very reasonable price, the Samsung SL-M2020W/XAA is very good printer perfect for the typical needs of a college student, although its lack of copy/scan functionality and color printing might be missed. Whether living in a dorm or an apartment, chances are good that in most educational institutions space will be at a premium for most college students. A printer can take up a lot of that precious space. This Canon printer has a space-saving design that doesn’t take up more up too much of that space. This printer is available in a few different colors if traditional black is too boring for you. While the color options cost a bit more, the price is much lower than many competing printers. Wirelessly printing from a variety of devices is easy, with the option of using AirPrint, Google Cloud Print, NFC, Mopria, and Canon Print. Despite the compact size, this printer does give you copy and scan functionality. It also does a good job with photo printing, probably not surprising given the Canon brand. Printing is on the slow side and it can be noisy but the overall value is quite high and the print quality is excellent. Verdict: The space-saving Canon PIXMA MG3620 is the cheapest 3-in-1 printer worth considering and it will be a perfect fit for most college students. If you only need printing functionality, the ultra-affordable HP DeskJet 1112 is definitely worth looking at. If you’re on a budget, you really can’t beat the price. The size is also quite compact and getting it set up is fast and easy. You can print in both black ink and color and the quality is surprisingly good, considering the low cost of this printer. To save money in the long run, you can use optional third-party high-yield ink cartridges. This printer, like HP’s OfficeJet series, is Energy Star certified, meaning that it is an energy-efficient device that isn’t going to waste electricity. Setting this up on your computer is pretty easy but you do need a CD-drive to install the software, something not all laptops today have. Of course you can still download the drivers on hp’s website and have your latest work printed in no time. In addition to this, the biggest downside to this printer is that it cannot print wirelessly. You will need to connect using USB printer cable, and one is unfortunately not included. Verdict: For the college student on a budget who doesn’t mind printing via a wired connection and doesn’t need copy/scan functionality, the basic but reliable HP DeskJet 1112 is the clear winner. 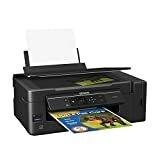 Do college students still need to buy their own printer, is it really better than using the university’s xerox machines? This really comes down to personal preference. Some students will probably get by just fine using their university’s equipment for all of their post-graduate degree printing needs. Most students, though, will probably prefer the convenience and control of having their own printer. After all, you might not have easy 24/7 access to the school’s equipment. Having your own printer means you can print at any time, at your own convenience. Most schools also charge students by the page when printing teachings. If you expect to do a lot of printing (and you probably will), you’ll probably save money in the long run by buying your own printer. Which brand has the cheapest ink toners? The Lexmark 35SC060 MS317dn offers the lowest ink cost per page of all the printers on this list. That said, they don’t have a high-yield ink cartridge option like some other printers on this list do, like the Brother HL-L5200DW and the HP DeskJet 1112. A high-yield cartridge is more expensive up-front but will definitely save you money in the long haul. When it comes to overall value of a printer’s ink, the Epson Expression ECOTank stands out. Instead of using toner or ink cartridges, it has refillable ink tanks. This might be the highest value ink solution of all the printers on the list. Of course, the cost of the printer is a bit higher at the start but over time, the ink value will pay off. It also starts you off with two full years of ink, around half of your college career! With other printers, you’d probably have to buy at least a dozen and probably more ink cartridges during that time period. Laser vs Inkjet for students? For the typical american college student who’s done with free handwriting, a laser printer is probably a better fit. Laser printers print faster and excel at printing clear black text. The toner these printers use is also a bit more affordable than the ink used by inkjet printers. For college students looking for a utilitarian machine that will be used only for printing papers, a laser printer is the best fit. Inkjet printers excel at printing photos and image-heavy documents. They are also easy to use and easy to maintain. For the learning college student who wants to be able to print photos and image-rich documents on campus, in addition to black-text papers, an inkjet printer might be better. Both laser and inkjet printers can be good options for college students. It really comes down to personal needs and preferences. Should I look at dot matrix printers? Dot matrix printers are no longer a viable option for most teachers or students. These forefathers of the modern printer might have the lowest printing costs per page and a cool retro flavor, they also have a slew of problems including frequent and difficult to resolve paper jams. What is “Amazon Dash Enabled”? Printers that are Amazon Dash enabled feature an ultra-convenient refill or replacement system to prevent the disaster of running out of ink at an inopportune time. When the printer is running low on ink or toner, replacement ink is automatically ordered on Amazon and shipped to your door. The system is easy to learn and use. This feature is optional but it can really minimize stress for students. Do you have your eye on any of these printers? Let me know in the comments! Do you have any printer questions? Feel free to ask and I’ll do my best to answer.